The UTC MJE13002 designed for use in high–volatge, high speed,power switching in inductive circuit, It is particularly suited for 115 and 220V switchmode applications such as switching regulator’s,inverters, DC-DC converter, Motor control, Solenoid/Relay drivers and deflection circuits. 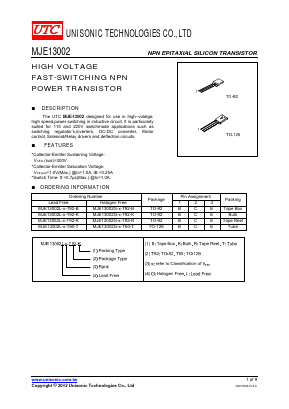 *Collector-Emitter Sustaining Voltage: VCEO (sus)=300V. *Switch Time- tf =0.7μs(Max.) @Ic=1.0A.